In 1852, Nova Scotia sea captain William Renton arrived in Puget Sound with some of the first settlers. Seeing the region's calm waters, he realized the area's potential for marketing wood products from the surrounding forests. In his first attempt, he built a small sawmill on Alki Point, but the point's exposure to wind and waves forced him to try a more sheltered location at Enetai, near Bremerton. This location failed as well, because it was too difficult for sailing ships to get through the tidal currents of Rich Passage. In 1864, Captain Renton purchased land around Port Blakely Harbor on the southeast side of Bainbridge Island. Here sailing ships could easily come and go, and the sheltered waters were perfect for storing large log rafts to supply the mill. During the next four decades, the Port Blakely Mill Company flourished, at one point becoming the world's largest sawmill under one roof. Its lumber was shipped all over the world, to California, Australia, England, Germany, France, South America and the eastern United States. On February 4, 1888, a devastating fire burned the Port Blakely mill to the ground. Because the winds were blowing onshore, rescuers were able to save shipping in the harbor by hauling the vessels out into the Sound. Captain Renton built a new mill in the same spot as the old using less-combustible materials such as heavy timbers and corrugated iron roofing. In addition, he installed a system of water pipes and 850 sprinkler heads. This picture supposedly highlights the schooner William H. Smith. The “William H. Smith” was built in 1883 in Bath, ME. In 1900 she was purchased by the California Shipping Co. of San Francisco. 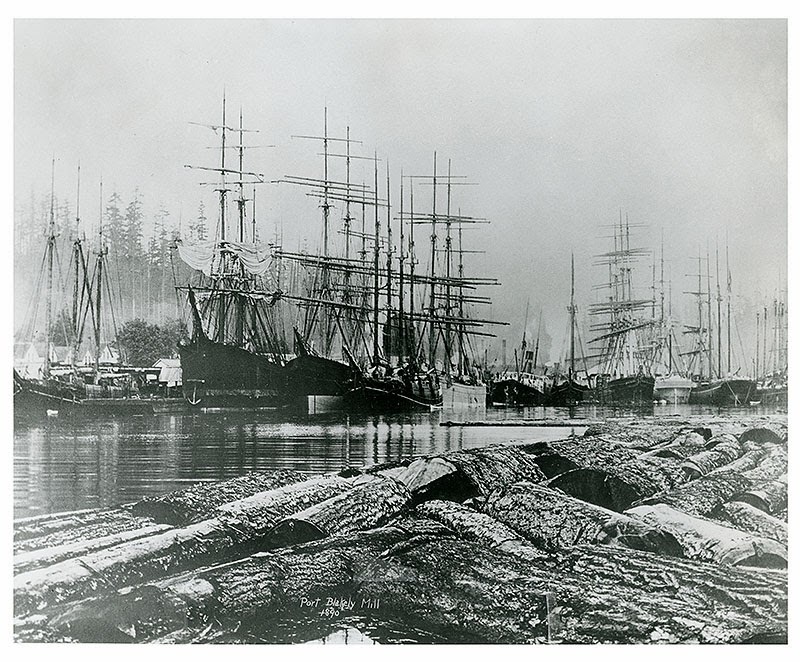 In 1911 the vessel was converted to a floating cannery by the Weiding & Independent Fisheries Co. of Seattle, WA. In 1917 she became a coal barge for the Pacific Coast Coal Co., and in July 1919 she was sold to Charles Nelson & Co. and re-rigged as a five masted schooner. Although operated until 1927, many of her later voyages were under tow. Later she was at Oakland until 1933 when she was sold to become a fishing barge in Monterey, California but went ashore at that port on April 14th, 1933.